Camera .. flash .. FINE! Home / Safer Driving / Campaigns / Camera .. flash .. FINE! On Monday 24th April, changes to the speeding fines system in the UK came into effect, and we, at insurethebox, are urging young drivers to read up on the new regulations to avoid being caught out with one of the new, tougher fines. 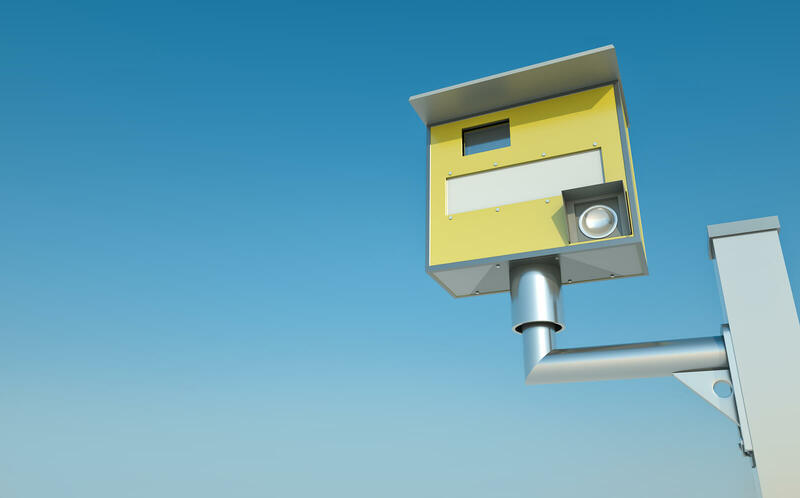 According to the Telegraph, almost 60% of drivers are unaware of the stiffer fines for speeding, with 44% of drivers under 25 saying that they didn’t know about the change. That’s where we can help. Back in February, we put together a blog post about the upcoming changes, and talked about the consequences of speeding for motorists. Here, we’ve rounded up a summary of the changes now that they’ve come into effect. According to the new guidelines, the changes will mostly affect motorists who are found guilty of excessive speeding. This involves drivers whose speeding offence is listed in the most serious category of speeding offences, known as Band C.
This means that drivers who are caught doing 51mph in a 30mph zone, or 101mph on a dual carriageway or motorway for example, will face fines starting from 150% of their weekly income, rather than the 100% level used before. According to Confused.com, this means that if someone is earning £30,000 a year, or £577 a week, the starting fine has risen from £577 to £866. Although 150% is the guideline, magistrates do have the power to increase this percentage to 175% in the most serious cases. They can also reduce it to 125%, if they feel that the circumstances suit a reduction. The maximum limit for fines has remained the same: £1,000 if you’re caught speeding on non-motorway roads, and £2,500 for speeding on motorways. As well as higher fines, offenders of these serious crimes face bans of between one and eight weeks, or can have up to six penalty points added to their licence. Most top motoring groups, authorities and police have backed the increase in fines, although some have voiced minor concerns. For example, Steve Gooding, RAC Foundation director, has questioned whether police officers will have enough resources to ensure that these new tough punishments will have a positive impact on road safety. Edmund King, AA president, told BBC News that he agreed with the changes to punish extreme offenders more severely. “Responsible drivers will welcome the changes coming into force today. The majority of drivers who keep to the correct speed, as well as driving to the conditions, won’t be affected. “It is only those who deliberately drive dangerously who will end up in court,” he said. If you’re not sure about the speed limits on certain roads, or want to brush up on your knowledge, then it’s worth taking at look at the gov.uk information on speed limits. However, adapting your speed to suit the conditions of the road is another important thing to be aware of. Check out our recent blog to help you smarten up on speed limits. All insurethebox policies come with the option to earn driving rewards for motorists who show that they can drive safely each month – including driving at a safe and appropriate speed. These rewards come in the form of Bonus Miles, and you can earn up to 100 per month – totalling an extra 1,200 miles every year. Not only this, but when it comes to renewing your policy you can save money if you show you consistently drive safely. Find out more about Bonus Miles and the other benefits of car insurance from insurethebox.